Hita preserves its historic centre with medieval elements, declared a Historical Site in 1965. Under Muslim rule, a fortress was established on the summit of the hill, with the town on its slope. Throughout the 13th century, a significant Jewish quarter was established, and a century later Juan Ruiz, Archpriest of Hita, wrote The Book of Good Love. In the 15th century it saw a final period of splendour, with the Marquis of Santillana as lord of the town. There are only archaeological remains of the old castle of Hita. Half a kilometre of the ramparts that the Marquis of Santillana ordered to be built still remain. Under one of its canvases the Palisade is found, a space where tournaments and jousts were held. The ramparts also preserve the Gothic style Gate of Santa María. Over its arch is the Mendoza family coat of arms. The Main Square or Archpriest’s Square was the market in the Middle Ages, and many of its homes belonged to Jewish families. In the high district the House of the Archpriest is found, containing a small museum dedicated to The Book of Good Love and other collections of interest. We can also visit the ruins of the Church of San Pedro which was destroyed in the Civil War. Parts of its walls and some tombstones of the nobility are preserved. The Church of San Juan, located a little higher, is in a Gothic-Mudejar style, except for the Herrerian tower. Inside, several coffered ceilings are notable. On the hillside is the plot of land which was occupied by the Archpriestal Church of Santa María. At this level the Barrio de los Bodegos quarter is located. This is the name for the cave-houses of medieval origin that make up this quarter. The “bodegos” dug into the hillside are formed by different rooms: the kitchen with the hearth, the bedroom alcoves, the granary and the stable at the back of the cave. The Tourism Office currently offers the option of visiting some of these caves. At a lower level than the bodegos, spread throughout the historic centre are the Wineries of the Jews; one hundred caves used from the Middle Ages to the 20th century for preserving the wine stored in earthenware jars. In addition to its historic heritage, Hita offers visitors other attractions such as the possibility of hiking in the town’s surroundings. Specifically, several indicated local hiking routes can be taken, leading to the ruins of the old castle, a spring converted into a fountain, a picnic area and a medieval bridge. Hita has a good range of accommodation for enjoying the tranquillity of a small village. Typical dishes can also be sampled in the restaurants, which also have children’s menus. This festival, declared of National Tourist Interest, has been celebrated every year on the first Saturday of July since 1961. Professor Manuel Criado de Val had the idea of presenting a theatrical work based on The Book of Good Love by the Archpriest in the Main Square of Hita. It was titled “Doña Endrina” and in the following years this event became popularly known as the “Fiesta de la Endrina”. Thus began a theatre festival which intended to commemorate the figure of Juan Ruiz, Archpriest of Hita, his work and his period. In the words of the Festival’s director, “everything around us must be transformed into a theatre: the streets of the town, the castle, the “bodegos”, and the lamb being roasted outside… From when we arrive in Hita to when we leave we must feel immersed in theatre and medieval magic”. Knightly tournaments are held in the palisade, a rectangular area 90 metres long located at the foot of the old ramparts. The knights take part in games of skill and military entertainment such as combat with dummy targets, throwing spears at a small wooden castle, and also games with rods and rings. 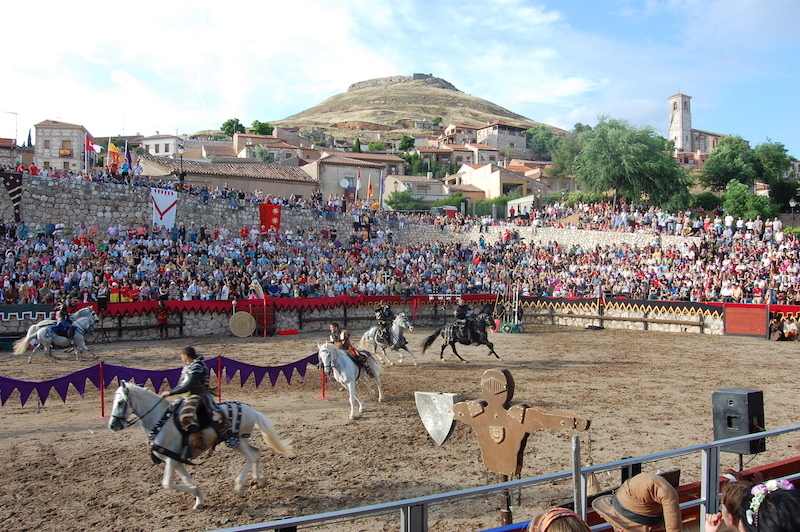 Afterwards they take part in jousts on foot and horseback, where knights enter into combat with lances, maces and swords while thousands of spectators enjoy the show. 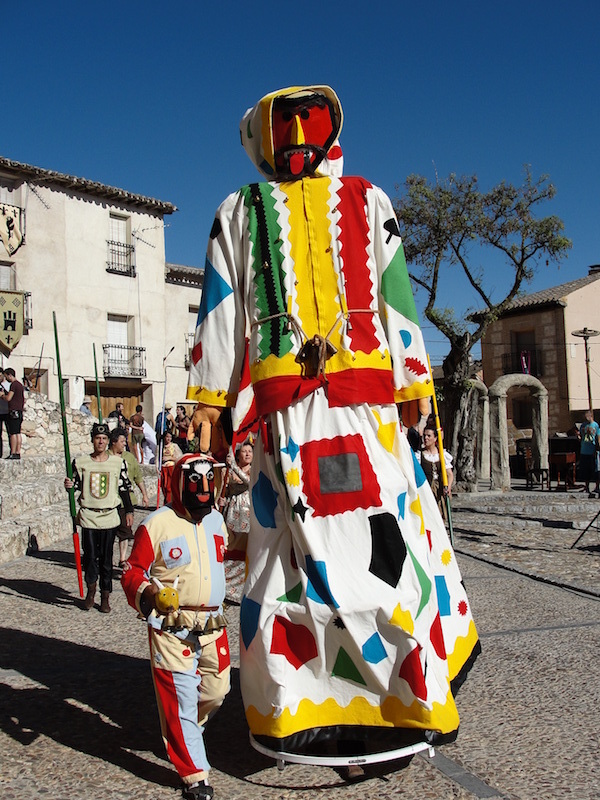 Since it began, the Medieval Festival has had the presence of a series of masked characters, “the botargas”, belonging to the folklore of the region, who pass through the streets of the town, ringing their bells, accompanied by musicians and troubadours. Along with the botargas there are also processions of the confraternities of Don Carnal and Doña Cuaresma forming characters of the Carnival of Hita. After the procession the fight between Don Carnal and Doña Cuaresma is enacted. This is a dramatization of an excerpt of The Book of Good Love which can be interpreted as a parody of medieval tournaments. The armies or confraternities made up of residents of the town face each other with pitchforks, pots and pans. Don Carnal and Doña Cuaresma appear on wooden wagons and carry large lances. The atmosphere of the historic centre, along with hundreds of people in period clothing and traditional music create an amazing atmosphere for visitors. The market has a large number of traditionally crafted pieces. 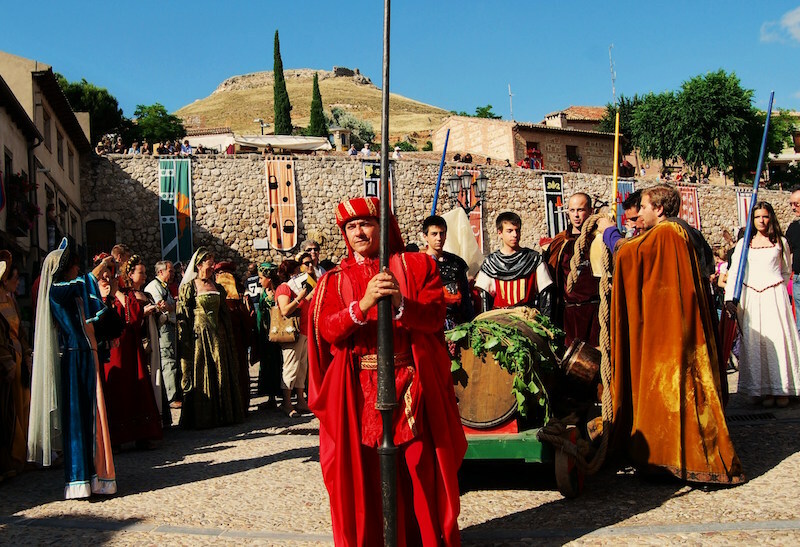 Tourists can also visit the winery caves, participate in the competition for best medieval outfit, sample the traditional gastronomy of the region, and in general enjoy a day full of surprises and magic. Best of all is that access to the medieval tournaments is free for children under 6 years of age.